BBC:- Family portraits often prove popular on social media, but this one has inspired people to click the like button more than most. American couple Aminat and Justin McClure posted it to celebrate their family’s mixed heritage, prompting thousands of people to share their own stories about growing up in dual and multi-cultured families. 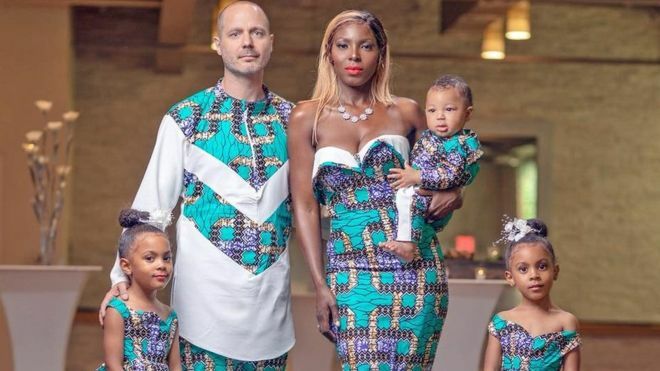 The couple, who live in New Jersey, US, posed with their three children in West African-inspired outfits to honour Aminat’s Nigerian heritage. She left Lagos, in south west Nigeria, when her family moved to the US when she was little. “We wanted to give the girls a lesson about how much diversity there is in the world so they learn to enrich themselves by opening their eyes to different cultures,” Justin told the BBC. The clothes were made by Cameroonian designer Claude Kameni, who contacted the family offering to design their outfits. The couple, whose identical twin daughters already have a large social media presence, posted the picture on Instagram and Facebook where it has been shared more than 15,000 times and attracted more than 69,500 interactions. The post, headlined “Celebrate your culture, but also the culture of those you love. Who’s here for this?” has received more than 2,200 comments. One woman thanked the McClures for showcasing interracial families, explaining that she too is in a “blended family”. Some people were inspired to share their hopes for raising children who feel connected to both their parents’ cultures and languages. he photograph brought back memories to one woman of her parents’ mixed culture marriage. “My mum is white, married to a Nigerian man and she wears Nigerian dresses occasionally. She embraces his culture so much she even learnt to cook his favourite Nigerian dishes and learnt how to speak his dialect,” commented Angela Ansaldi. For the McClure family, it’s not the first time that they’ve made an effort to explore Aminat’s background with their children. They have previously visited Nigerian restaurants to cook food like jollof rice and puff puff [a sweet dumpling] with the girls.